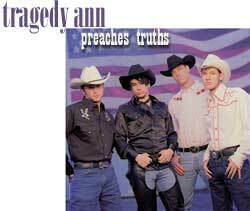 Tragedy Ann is a 4-piece rock band with a true heart for God. Consisting of a couple members of the late Sometime Sunday, Tragedy Ann delivers good music with a great message to youth who need to hear it. Last month, TA's lead singer Mikee answered some questions for us. This interview took place on: 1/22/00. Jesus freak Hideout: What's the story behind the name "Tragedy Ann"? Mikee: My friend had a band that had a song called "Tragedy Ann" so I stole it from him. I liked it because so often we put on this mask like everything is alright and when someone asks "How are you?" we tend to say "Great" when that may not be the case. I think a lot of the time we tend to hide some of the pain that we feel. I think the name tells that story. Mikee: I had just left Sometime Sunday and I was thinking I wasn't going to do anything else, but I was playing with some of my friends and it just clicked, so here we are. Mikee: Foo Fighters, Cracker, Social Distortion, The Altar Boys, ACDC, Smithereens. JFH: A minor, yet still significant shift in style between your two albums can be heard. What brought about this change? Mikee: I got a little more confident in my writing I guess. I still think I s*ck but I just play what I like. JFH: What is the song "Preachin' Lies" about? Mikee: It's about the people all through my life that told me that I wouldn't amount to anything and the youth pastors that pushed me away because I listened to Christian underground music (instead of Michael W. Smith, Petra etc. ), and looked weird. JFH: What inspired the song "Tank?" Mikee: My 2-year-old daughter. That's her nickname. Her real name is Veronica. I have a 5-year-old daughter named Shayde. She was the inspiration for the song "Little One" on the first record. JFH: Your song "Seek" from your previous album Lesser is recorded again on One Nation Under God. What led you guys to perform this great song again on disc? Mikee: We weren't finished with it, so we finished it and recorded it again. JFH: The hidden tracks on your latest album are interesting. Can you tell us a little about the collection of moments recorded on there, especially the "Taco" song? Mikee: I've always liked to put funny stuff on the end of my records. It's my personality. I want people to know that we are not that serious about stuff. Ive been doing it since the Sometime Sunday records. We didn't put anyhting on the first record because we were rushed in the studio. JFH: What is your favorite Tragedy Ann song? Mikee: I like them all, but "I'll Get Through" is a fun song to play. I like the lyrics because no matter what happens to me I will get through because of Jesus in my life. Mikee: Most definitely Pepsi. Coke is lame. JFH: What does the future hold in store for Tragedy Ann? Mikee: We are doing another record and we will be touring in the summer. Mikee: We really don't get embarassed. Mikee: I like the bands Ember, Spoken, Mike Knott, man the list is huge. I grew up in Southern California and was there when Christian alternative started so I like the old stuff too. I just wish there were more quality bands out there. It seems everyone and their mother has a label and a lot of bands are not that great. Mikee: Come see us when we play!